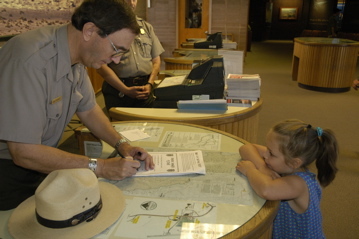 Our visit to Death Valley has been too short, but unfortunately work intrudes. Cell phone service is limited to spotty analog coverage, and I’ve had seven dropped calls this morning in an attempt to accomplish one short task. Forget about Internet service. We will mark Death Valley as a spot to return to again, perhaps next winter. The drive west out of the park is a tough one for any car, which is why the park service spots tanks of “radiator water” alongside the road. A sign says “Prevent overheating ““ turn off A/C next 20 miles”. The road climbs over the Panamint Range to 5000 feet, and even though we got on the road by 10:30, it was already 95 degrees. The Nissan did very well for a truck hauling an 8000 lb trailer up 5000 feet vertically. As the road steepened, we did need to downshift to keep the engine RPM high. Higher RPM helps the engine and transmission cooling. Eventually, we needed to slow to about 25 MPH in first gear. There was plenty of power, but trying to go faster we would risk overheating. Another tip I would give any Airstreamer coming out of Death Valley is to be sure to have plenty of fuel. Climbing up these hills, you won’t get the usual fuel economy. 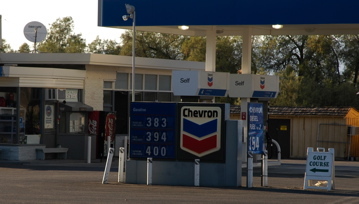 We chewed up a half tank in no time at all, and were forced to stop at one of the tiny outposts on the way west for fuel at a painful $3.76 per gallon. I bought five gallons, and was reminded of the last time I was in Italy, paying about the same rate. Eventually Rt 190 meets Rt 395 at Lone Pine, and 395 heads north through the Owens Valley. This is an amazingly scenic drive. The sharp and snow-capped peaks of the Sierra Nevadas loom to the west. 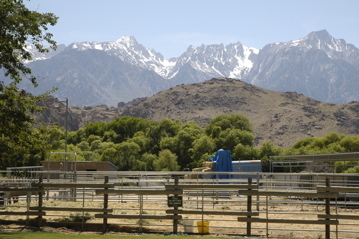 The valley is green and quiet, and to the east are the dusty brown desert foothills of the Inyo Mountains. This is wonderful country, magnificently isolated by the walls of rock to the west, and the hundreds of miles of scorching desert to the east. Traveling north we passed through a series of small towns (Independence, Big Pine, Bishop), slowly climbing up the tilted valley floor. To our left we passed the east entrances of King’s Canyon, Sequoia, and Yosemite National Parks, but one glance at the steep winding roads told us we would have a tough time entering through those back doors. In fact, the roads to Yosemite and Devil’s Postpile National Monument are still closed for snow. The snow in the mountains that looked so far away from yesterday’s hike at Dante’s View got closer and closer. It was hard to believe we were heading toward it, with the memory of 100 degree temperatures and scorching hot beds still fresh. In fact, the latent heat of Death Valley is still with us. We’re now around 7,000 feet in the town of Mammoth Lakes, where we are parked in the National Forest campground ($15, no hookups). When we arrived, the outside air was a mild 61 degrees, but when I opened a storage compartment in the back of the Airstream, I was surprised by a blast of heat. Every closet and cubby is the same way: storing the dry hot air of Death Valley. The interior of the trailer was 82 at 9 pm this evening. It may take most of the night to cool the trailer off, but at least we will have a much more comfortable night’s sleep. It has been a fantastic day in Death Valley, despite a slow start. I had hoped to get some hikes in the valley early in the morning, but Emma slept until 8:30 and by then it was already 85 degrees. I found out that the optimistic forecasts I was seeing from Las Vegas were actually for Las Vegas rather than Death Valley. Today’s forecast temperature was for 101 degrees and it eventually exceeded even that, hitting 103 by mid-afternoon. So we changed plans, and did just one valley hike, in Golden Canyon. The canyon is actually an alluvial fan (basically a lot of debris washed down from the mountains over millions of years), which was later cut by floodwater to create a canyon that is about 50-100 feet deep. It’s a 2.5 mile hike, roundtrip, all uphill for the first 1.25 miles. It was a challenge indeed to keep Emma entertained and motivated on this tough hot hike, but eventually she got into it, and with plenty of water breaks in the few spots of shade, we all made it up alive. Let me tell you about water intake in the desert. Don’t take chances. Even standing still in the desert at 80 degrees, you will need a lot more water than you usually consume, just from the dry air. Imagine hiking uphill in 90-95 degrees in full sun. We took over a gallon of water with us on this short hike, and drank it all before we reached the end. For a day, the Park Service recommends at least one gallon per person, but frankly I consider that minimal. We started drinking water in large quantities from the moment we woke up and didn’t stop until bedtime. We kept several gallons (in individual 16-oz bottles) in the fridge at all times, and were constantly replenishing the supply. Back at the trailer at 2:30, it was 101 degrees inside with both vents running on high, and the awning out. Relatively speaking, this was OK, since it was 103 outside. But our refrigerator couldn’t keep up. It got to 56 degrees inside, and our milk started to spoil. I have known that most RVs don’t have adequate refrigerator ventilation, and have intended to install a small fan to help with that issue, but never got around to it. I may be talking to one of the next dealers we visit (Mountain Family RV in Reno NV, or George M Sutton in Eugene OR) about it soon. I can’t be too hard on the refrigerator, though. Everything in the trailer was hot to the touch. We ate lunch (with lots of drinks), stripped down to underwear, and then took a short siesta on the hot beds. I woke up at 3:30 absolutely roasting alive, and thirsty again, and decided that it was time to throw everyone in the shower. We didn’t need the water heater. We found that running the coldest water we had, the bathroom filled with steam. It was the heat of our bodies that did it ““ the water was actually steaming off our hot skins! We let ourselves drip dry instead of toweling off, and stood under the fans for maximum chilling effect. Wet towels on the floor helped cool the lower part of the trailer by evaporation, and we used the melted ice water from our drink cooler to chill our feet. We also soaked hand towels in the ice water and draped them around our necks. It sounds funny, but all these tricks worked great. We were completely comfortable when we were done playing with the water. But we knew it wouldn’t last, so we piled in the car and headed for Dante’s View, 5000 feet above the valley floor. 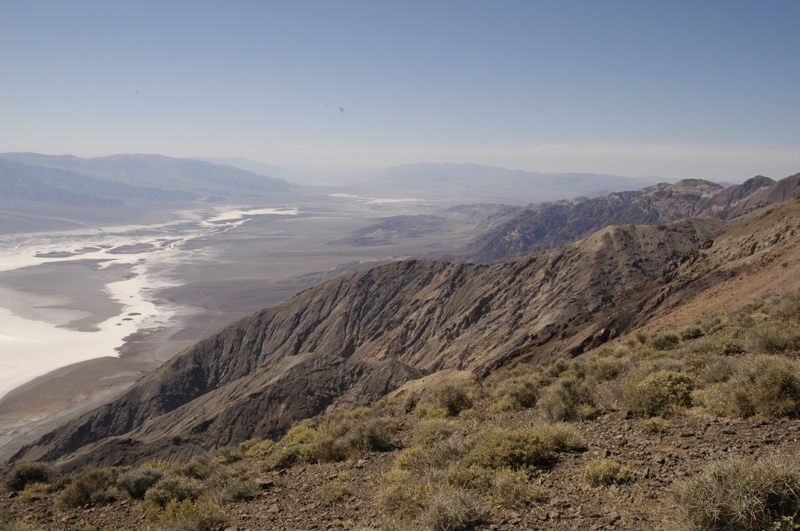 Higher altitudes are where you want to spend your time in Death Valley this season. Dante’s View was clear, gorgeous, and beautifully cool at about 78 degrees. 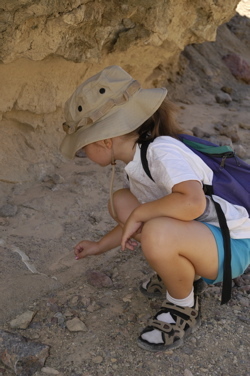 On our short hike up there, we spotted a horned lizard and zebra-striped lizard, which were useful for Emma’s Junior Ranger workbook. 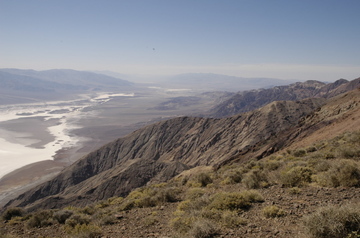 In the picture above, you can see the dried salt creeks snaking across the valley floor. 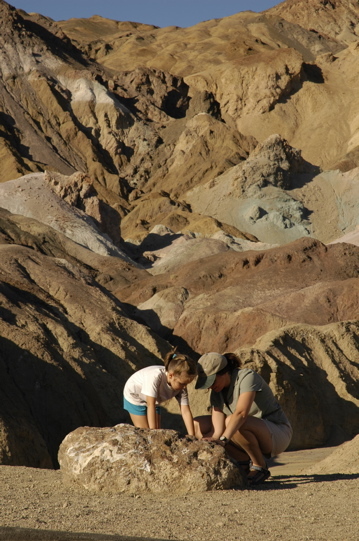 Death Valley has no natural outlet, so minerals washed down from the mountains collect permanently, leaving a “chemical valley” of borax, salts, and various other chemicals that can pickle any creature that is unfortunate enough to die there. 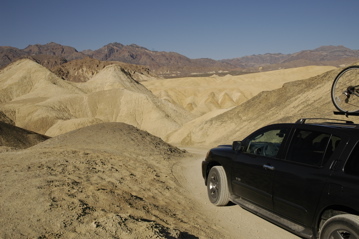 After Dante’s View, we dropped in on Zabriskie Point, and 20 Mule Team Canyon. The latter is a 4WD road which passes some of the many abandoned mines in the park. It’s worth the short loop if you have a high-clearance vehicle. We didn’t need to engage 4WD to do the drive. Then it was off to Artist’s Drive, another one-way loop road, accessible to all vehicles under 25 feet long. This is a fun rollercoaster ride past some pretty colored layers in the valley walls. Solar note: Our system of parking for afternoon shade seems to be working. Even with one panel blocked in the late afternoon, we are generating more power through the solar panels than we can use, even with the two Fantastic Vents running 24 hours a day. We will have no shortage of power on this trip. Yesterday Rita (blog reader) asked if there was a way that solar could power an air conditioner. Unfortunately not. We knew going in that we would be reliant on fans. We’ve noticed that the park seems dominated by Europeans this time of year: German, French, British, and eastern European (Czech? Poland?) I’m not sure why they want to come to this hard part of the world in the hot season, but they are undeniably here in significant numbers, renting Class C RVs and even pitching tents in the scorching heat. Eleanor and I have tent camped in Death Valley before, but not in this heat. It would be a tough slog. The campground offers no showers, only a low water spigot. I have seen the young foreign students on holiday soaking themselves at this spigot. At 8 pm last night it was still in the upper 90s and I was grateful we had the distractions of a movie ( “Chronicles of Narnia: The Lion, The Witch and The Wardrobe”), a good grilled dinner, and cool showers before bedtime. It made the fierce conditions more bearable. Since our last visit to Death Valley in 1997, the park service has cut a deal with the local Native American tribe, the Timbisha Shoshone. 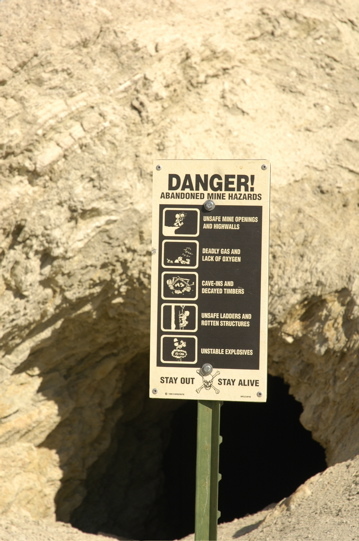 They now have a private area in the heart of the valley near Furnace Creek, nearly 200 feet below sea level. It’s a tough place to live; not much water, and excruciating heat all summer. We were lucky to get relatively mild temperatures. When we arrived it was in the low 90s, but we knew it would get hotter the next day, so we picked out a campsite in the Furnace Creek campground that was partially shaded. 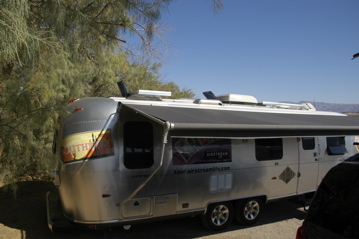 The idea is to have a spot where both solar panels would get full sun most of the day, but the tamarisk trees would shade half the trailer in the late afternoon. You’re probably thinking, “Hang on — no hookups in that campground?” Yes. That means no air conditioning. So we expect that our two Fantastic Vents and plenty of solar power will be the keys to survival. The forecast for tomorrow is 100 degrees. Even tonight it’s not going to cool much. At 10 pm, as I write this, it is still well into the 80s. Death Valley doesn’t cool off at night much. The surrounding mountains trap the warm air. That’s one of the reasons it is so hot here. But it is beautiful. The views and wildlife are everywhere. 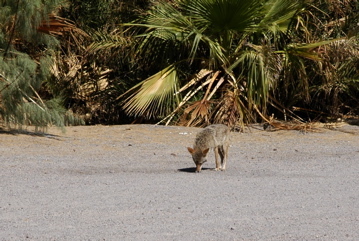 During the afternoon we spotted a coyote wandering by. At sunset we were able to walk around and spot dozens of bats catching their dinners in the red dusk of sunset. I am sure, despite the heat, we will have a good time. Last night was busy enough for me to miss posting … something I hope will be an increasingly rare event. Brett and I went out in the morning to find him a new cell phone since his never recovered from jetskiing. But we spent most of the day working. Yes, it was a beautiful holiday weekend but we spent Sunday at our laptops. That’s how it goes in the self-employed/traveling mode. We had to pay for playing golf on Friday and jetskiing on Saturday. 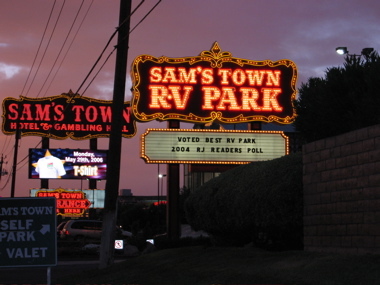 But no trip to Las Vegas is complete without losing some money, so while we had lunch at Sam’s Town, we bought a Keno ticket for $10 (2 games). Guess what happened? I dropped Brett off at the airport and picked up Eleanor and Emma two hours later. Then it was back to work while Eleanor unpacked and settled back in. This morning we are prepping for continued travel –laundry, more work, cleaning, culling out stuff we don’t need, packing in a few new things picked up recently. The plan is to head to Death Valley for a couple of nights. It should not be horribly hot according to the weather forecast — in fact, today the high is projected only in the 80s, which is less than we had in Zion and here in Las Vegas last week. We may not be able to get online while we are there. If so, I’ll put up some further entries ASAP. Hope you had a good long weekend! As promised, Brett and I went jetskiing on Lake Mead today. We learned a lot: what not to pack, how not to dock the boat, how not to protect one’s cell phone, and what size waves one should not attempt to fly over at 35 MPH. It was a very educational session. The basis for most of our education was high wind. It was blowing between 20 and 30 knots on Lake Mead, with gusts up to 54. This meant waves up to 4 feet in the middle of the lake. It was also mostly cloudy and the air temperature never got above the 70s, amazingly enough. So while this kept the lake free of competing boat traffic, it also meant a rough ride on the open water. The spray from our boats either outran us, or flew back into our faces like little needles, depending on which way we were heading. The pounding of the waves caused our can of Pringles chips to become Pringles mulch. 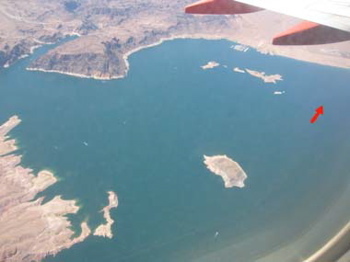 One bottle of cranberry juice flew out and is now resting at the bottom of Lake Mead. The plastic baggie containing our cell phones shredded, and the red Gatorade leaked onto everything. Brett is eating ibuprofen for dinner and I look like I’ve got a horrible skin disease from the dried minerals on my arms and legs. Still, it was fun. The protected coves gave us plenty of room to play around, and we were able to boat within a few hundred yards of Hoover Dam. The canyons and inlets are gorgeous and fun to explore. 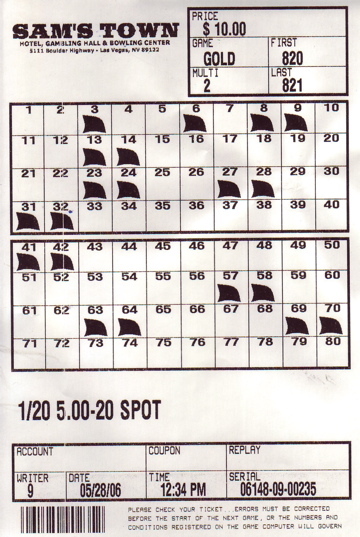 We logged about four hours on each boat (not counting snack breaks), and with our shorty wetsuits we were reasonably warm despite the strong wind. We’re already talking about going again next year. 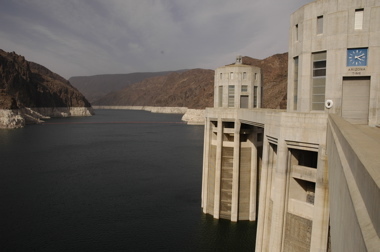 After returning the rental boats, we headed back to the Airstream for a change of clothes and then to Hoover Dam. About this time my cell phone dried out and began to work again. Brett’s phone got wetter and it seems to be non-functional, unfortunately. 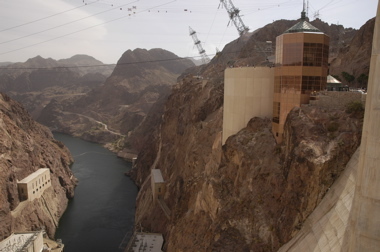 So while it was drying out on the dashboard, we checked out the incredible Hoover Dam, built from 1931-1935 on the Colorado River about 300 miles southwest of the Glen Canyon Dam we visited just a couple of weeks ago. The dam tour is worth doing, at $11 for adults. Not only do you get to go down inside the dam, but the new exhibit building (the copper-colored structure in the right of the photo below) is very good. And the views are tremendous in every direction. I was also impressed with the town of Boulder City, which is the home of the Hoover Dam. It has a vibrant downtown, lots of culture and activity, is not too touristy, and sits in a scenic spot just 20 minutes from Las Vegas. We may check it out further when Eleanor and Emma get back, if there’s some time on Monday. 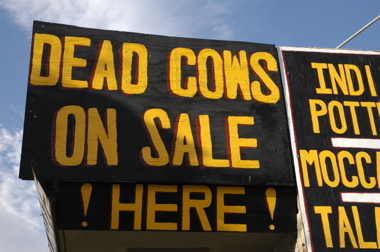 Here’s a Sign Of The Week for you, as found in Boulder City. I don’t golf. So it was with great trepidation that I accepted Airstream’s invitation to play in a golf scramble this morning. Brett insisted that I play, so we got up early to do some work before catching the 7:30 bus to our 8:30 start at the Angel Fire golf course. Now, cruising around on an electric cart, through a beautiful golf course in the desert on a gorgeous May day is not such a bad thing. Our early game kept us out of the highest temperatures (it was about 100 again today). But otherwise, my golf game was 18 holes of humiliation. I redeemed myself slightly with one lucky chip shot and a few halfway decent putts, but otherwise the other members of my team carried the weight. Fortunately, we were playing “best ball”. By the end, I was a lot more appreciative of how 18 holes can wear a person out, and our team was 6 under par. We came in third of about ten teams. 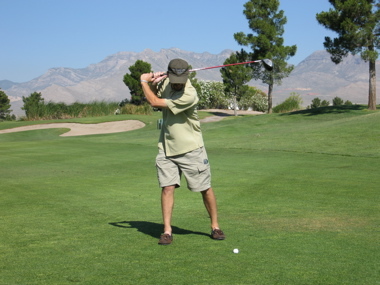 I think before I attempt to play again, I’m going to need some lessons in how to swing the club and actually hit the ball in a useful direction. Back at Caesar’s, we dropped by the pool to talk to Airstream people a bit in the afternoon (lots of interesting people-watching poolside). Then we picked up our bags and departed via taxi to pick up the Nissan. I’m pleased to report that after the transmission fluid re-fill, it drives like normal again. No charge since it was under warranty. Next job was to catch up on work for a few hours. We headed back to the Airstream, and started our working day at about 4 pm. This has been a successful week but it has also left us with a lot of work to do. Both Brett and I are beat. We only got five hours sleep last night and it has been a complicated few days. 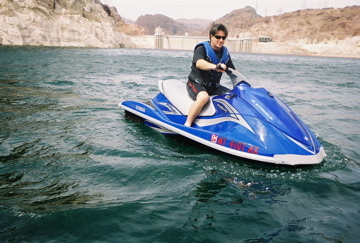 We plan to decompress tomorrow by jetskiing on Lake Mead. I’ll have photos of that by Saturday night. I have to admit that there’s not much news I can talk about today. Eleanor and Emma are doing their stuff in Vermont but I’ve been so wrapped up in the Airstream dealer meeting that I have hardly had time to even call them. Brett and I are running around trying to get dealers to advertise in the magazine all day. 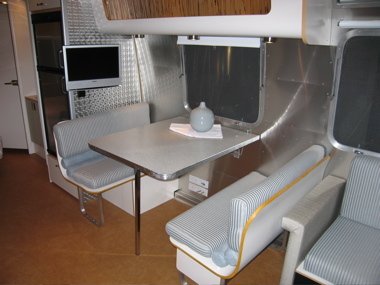 I can show you an advance pic of a new Airstream that was shown here at the Dealer Meeting. 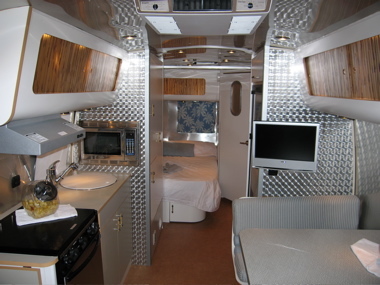 There are some very cool new floorplans coming out, including a 27-foot FB (rear-door) model, and in smaller length they have introduced the “Ocean Breeze” trim package shown below. It’s a derivation of the popular Quiksilver trailer. Sorry for the poor quality images. I had to borrow a camera since I left mine back at the trailer. The new rigs coming out are pretty cool. They’ve updated the Classic into a 27-foot Classic Limited that is quite nice. The 19-foot Custom Bambi by David Winick is here, and that is beautiful. They’ve also added to the International line and added some new colors. And the Base Camps are finally here, looking very slick with tons of neat accessory racks and options.